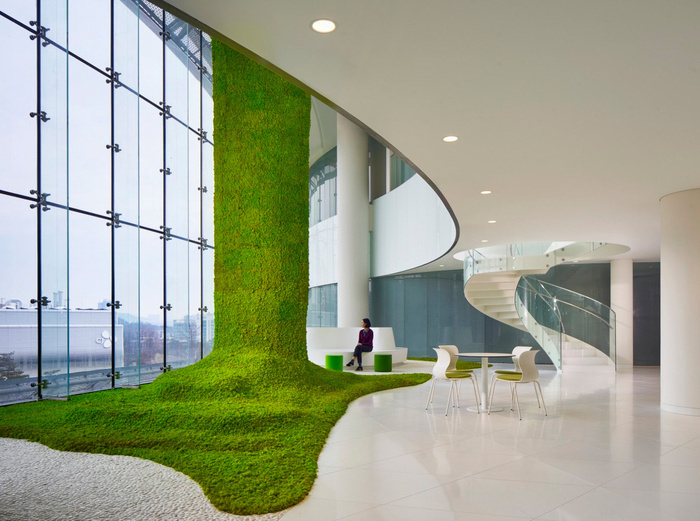 CannonDesign designed the Blossom Park offices of conglomerate holding company CJ Corporation, located in Suwon, South Korea. A new world-class research and development headquarters for CJ Corporation repositions the company’s operations into a new interdisciplinary format that will increase efficiency, create a culture of integrated innovation, and accelerate speed to market. Conceived as “The Only One,” this unique 1.2 million sf building consolidates CJ Corporation’s previously disparate pharmaceutical, biotechnology, and food products businesses into a single location, enabling it to create industry-defining product strategies and increase its global competitiveness. Deep research into CJ’s business elements and unique culture enabled us to build on the client’s vision for the highest quality internal brand experience and the need to enhance innovation and collaborative entrepreneurialism across all its business units. The design locates the full spectrum of research and development facilities in three high-rise towers around a dynamic central atrium. Surrounding the atrium at the first and mezzanine levels are 100,000 sf of amenities, including product showrooms, a café and restaurant, library and work out facilities. This three-dimensional connectivity is further emphasized with a series of double-height interaction spaces linking labs, offices, and amenity spaces within each tower.